Although the cooling system on your boat shares some of the same features as your car or truck, the systems are actually quite different. For this article, we will use a standard inboard/outboard configuration for discussion. First off, when you are cruising around in your boat, you are riding in one big huge radiator. Unlike your vehicles water supply, I doubt you’ll ever ride long enough to heat up the entire lake to the point your marine engine will run hot. For most marine engines, raw water (lake or sea water) is drawn into the lower part of your outdrive through small holes by a water pump. Some boats have water pumps housed in the lower sections of the outdrive unit, and some have raw water pumps mounted on the engine, and they are driven by a belt, or shaft. Those mounted on the engine should not be confused with the circulator pump on the front of the engine, such as the one you have on your car or truck! As you will read later, it has a different job to do. These raw water pumps pull water from the lake, and push the water towards the engine. Most raw water pumps are made with metal or plastic housings, and use rubber impellers to pump. Although many get years of service from the small rubber impellers, I think it is best that they are changed each year when normal service is performed. Often, when they do fail, they send debris and rubber pieces throughout the cooling system resulting in blockage. At that point, the system must be back flushed and cleaned. After the raw water leaves from the pump, it will flow through oil coolers, power steering coolers or any other heat exchanger device your engine is equipped with. (Innercoolers for superchargers, fuel coolers, etc.) At the point the raw water reaches the engine, it enters a specially designed thermostat housing. This housing allows water to be diverted to both the engines water circulating pump, AND the exhaust system as well. First, lets talk about why water goes to the exhaust system first, if not the same time as the circulating pump, or engine block. Water MUST get to the exhaust manifolds rather quickly so that they do not overheat. They must have a steady diet of cool raw water flowing through them all the time so that they stay nice and cool, even while the engine is getting up to operating temp. If not, the exhaust system would seriously overheat, and burn any rubber connection hoses associated with it. In extreme cases, it can catch the bilge of the vessel on fire. Your exhaust manifolds should never be excessively hot to the touch. I am not in anyway telling you to go out and touch them after running the boat either. All the while the specially designed thermostat housing is diverting water to the exhaust system, it is sending water to the circulator pump, thus filling the engine block full of water. Now, here is the tricky part. When the engines cooling cavities are completely full of water, the flow to the engine is stopped, and all water travels to the exhaust manifolds. The circulator pump then (as the name implies) circulates the water in the engine block until the water reaches the predetermined designed operating temp. range. At that point, the thermostat opens and the specially designed thermostat housing returns to dividing the flow of water to the engine block/circulator pump and the exhaust system manifolds. Meanwhile, the thermostat regulates the desired water temp. and the amount of water exiting the engine block before it heads downstream to the exhaust. It is very important to keep your cooling system in proper operation. The system often gets debris in it, such as sand, trash, grass and parts of broken impeller lodged about. I know of several on this forum that have had cooling system problems on both inboard and inboard/outboard engines. Sometimes it takes a while, but the systems can be cleaned and repaired. The above system discussed is a typical marine cooling system. There are many other variations, including closed cooling systems and very high performance systems. Some systems are custom routed to suite the particular engine builder or application. Any comment is my opinion, and based on my on hands on experience, or repairs. Should you have a special request for a discussion/column subject, please email me at cathouse marine@aol.com. I would love some ideas. 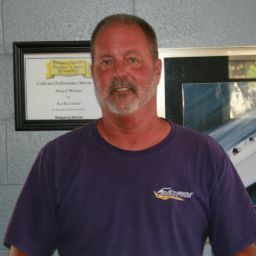 Steve Northington, Cathouse Marine, LLC. Steve - You forgot the part about ensuring when replacing the thermostat that you do not install such backwards, otherwise the thermostat will not function properly and it will appear per your temp gauge your vessel is overheating when in fact it is not. Yes, MAV, I knew it was coming. LMAO. Sorry. excellent post. Very helpful for people like me that love boats but don't know how they work. Here's an issue folks need to know about . . . it's taken me 3 years with trial and error and in and out of the service bay to figure out the real issue and how to prevent it . . . I have a 2000 model Mercruiser 5.0L 240HP inboard/outboard. I have had some issues with what I now know is vapor lock, or something of the kind. With the preliferation of ethanol tainted fuels during the past few years, this problem only started in 2007. For 7 years, I didn't have a lick of trouble, but I have seen it be much worse when I have used cheap, ethanol blended fuel. However, ethanol free fuel is now almost impossible to find. What happens is when I run the engine fairly hard and get it to a little above normal operating temp - - around 180 degrees in my boat - - and then shut the engine down quickly, it will vapor lock. When I go to crank it back up, it turns over, revs up and down a few times and dies. Then it won't start until it sits for 45 min - an hour and cools down. You can poor gas in the carb and the engine will start and run until it burns up that fuel, but that's it. That initially led me to believe I had a fuel pump or fuel line issue. I have found (with a little help from a mechanic), that the prevention is this. Before turning the engine off, let it idle for several minutes to allow the engine temp to cool down back to around 170 degrees on my boat - - and I watch the temp gauge to ensure that it has gone down. Since I have been going through this procedure, I haven't experienced this vapor lock situation. Thought this might be a good topic that you could explain the ins and outs of vapor lock in laymen's terms and the affect of ethanol blended fuels. Hopefully, this could save some folks a lot of aggravation and money that I have already experienced.